What does it mean to leave city life behind? Can the reality of living in the countryside fulfil our desire for a better, simpler, more creative life? This book is an attempt to shed light on what rural life can be like today, with all its joys and challenges, providing a fresh look at the people and scenes thriving outside urban spaces. From experimental co-habitation in a renaissance castle to oversized artworks on a farm, City Quitters offers a global perspective on creative post-urban life: 22 stories from 12 countries and five continents, all based in places with fewer than 10,000 inhabitants. Karen Rosenkranz is an independent trend forecaster and ethnographer based in London. She has travelled all over the world spotting shifts in behaviour, attitudes and aesthetics, and has helped creative agencies from Amsterdam to New York uncover important socio-cultural changes. 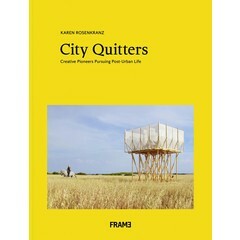 Fascinated by things that haven’t found a place yet, and anything that might impact how we live in years to come, Rosenkranz continues to explore the origins of fresh and original ideas with City Quitters.